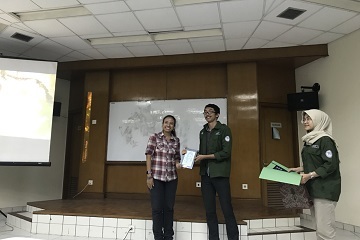 The Wildlife Profession Student Association (Himpro Satli), Faculty of Veterinary Medicine, Bogor Agricultural University (FKH IPB) held a seminar entitled "Pongo tapanuliensis: Long Lost Treasure Tapanuli" on Dramaga's IPB Campus, Thursday (10/19). The seminar presents Dr. Puji Rianti, one of the genetic researchers in conservation of orangutan species. "If the Orangutan Tapanuli is referred to as the long lost treasure, it's actually not. Because actually the Orangutan Tapanuli has existed long ago. However, everyone thought that the Tapanuli Orangutan was a Sumatran Orangutan, "said the Teaching Staff of the Department of Biology, Faculty of Mathematics and Natural Sciences (FMIPA) IPB. Based on Dr. Puji, Tapanuli Orangutans are found in the Batang Toru highlands, South Tapanuli, North Sumatra. Orangutan Tapanuli is officially designated as a new species of Orangutan at the end of 2017. There are several differences between the Tapanuli Orangutan and the Sumatran and Borneo Orangutans. "From a morphological point of view, Tapanuli Orangutans have more red hair and dreadlocks. This is likely due to the higher altitude of the Tapanuli Orangutan's residence than the Sumatran and Borneo Orangutans. The shape of its face is more haired and when viewed from the cheek pads, the size is in the middle between the size of the Sumatran and Borneo Orangutans. The shape of the bearing tends to be flat, "explained Dr. Puji.